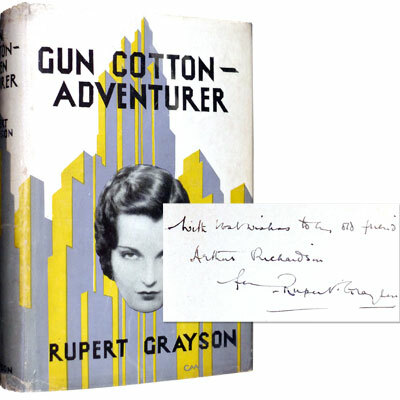 Inscribed ‘With best wishes to my old friend Arthur Richardson from Rupert Grayson’. This time Gun Cotton sails for New York. 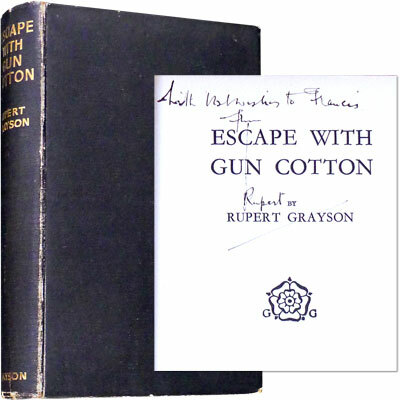 First edition of the third ‘Gun Cotton’ book, in a bright example of the scarce and delicate dust jacket. Inscribed to the title page ‘With best wishes to Francis from Rupert’. Inscribed to the title page ‘Gwen and Francis with love from Rupert’ author’s printed name crossed through and replaced with hand written initials ‘R G’. 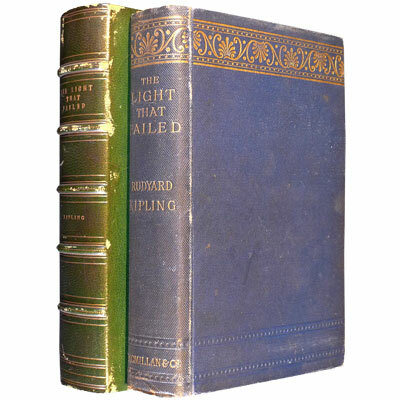 Schoolboy japes and mischief abound in this volume about a trio in an English boarding school, based on Kipling’s own experiences as a young man. An amusing and entertaining novel from one of Britain’s most famous authors. The text’s initial appearance in the United States was through its inclusion in ‘Out of India’ , published in 1895, but this unauthorised printing constitutes the first separate American edition. all eight sketches from the authorised 1891 London edition ‘The City of Dreadful Night and Other Places’. All that aside, this is a superb example of the most magnificently presented edition, including a full page frontispiece of the author from Strang, and two full page black and white illustrations by Charles Farrand. In 1898 Kipling first travelled to Calcutta and this is the account of the visit, and if you have travelled to what is now ‘Kolkata’ over the past 30 or so years and been taken aback but its sheer personality, then I believe the Calcutta of the late 1800’s was an even more powerful visual and tactile experience, as Kipling here wonderfully describes. A compilation of 27 stories and one poem, sixteen stories and the poem appear here for the first time, the remainder were published five months earlier to counteract unauthorised American printings, a common challenge for Kipling. Housed in bespoke sheepskin lined green morocco leather slipcase. Hiding amongst the more standard colonial short stories of Kipling in this collection, are six of a darker nature, nightmare murder, premonitions, curses, and all - ‘Bubbling Well Road’, ‘Dream of Duncan Parrenness’, ‘Courting of Dinah Shadd’, ‘At the End of the Passage’, ‘Mark of the Beast’, and ‘Return of Imray’. 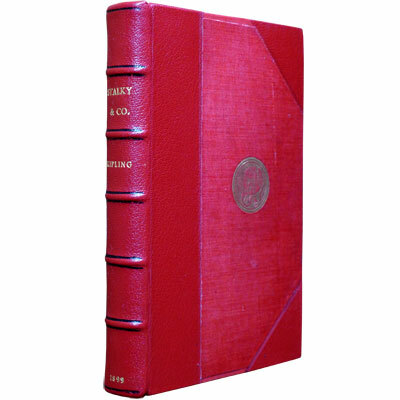 A fine first edition, in bespoke leather and sheepskin slipcase. With twenty full page illustrations by H. R. Miller. 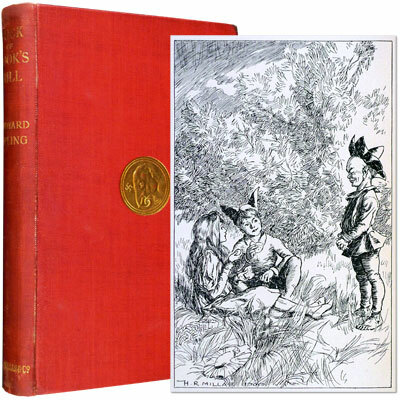 Kipling's popular series of tales and poems set in different historical eras, including Roman Britain, Anglo-Saxon England, The Norman Conquest, The Middle Ages and the Tudor Period. The stories are all told to two children living near Pevensey, East Sussex, by characters magically plucked out of history by 'Puck'. Long thought to be a key inspiration behind C S Lewis’ beloved ‘Chronicles of Narnia’ series.